Numbers have enormous power and the numbers provide dynamism to the human being from cradle to grave. Common people don’t understand this and so never take care of it. We fail to recognize whether the numbers are making any impact on us or not. However, numbers always lay their impact on our attitude, behavior, work and enable us to take decision either in wrong or right way. But there is hardly any doubt that these numbers have extra ordinary power and they always influence the mankind. So it is essential to learn and understand how to channelize the positivity of these numbers into our lives. 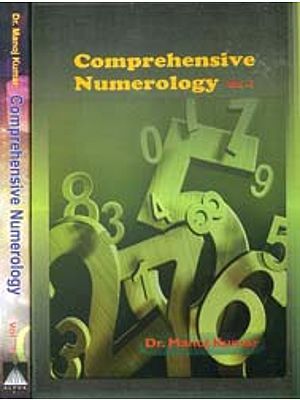 This book describes how the numbers originated, their mystic powers, to calculate the principal numbers, destiny numbers etc. 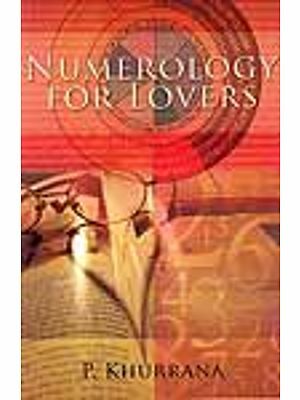 This book is also helpful in learning to predict through numerology, how the change of the spellings of the name transform the destiny radically, how to choose numbers for vehicles and the remedies to correct the negativity of prevailing numbers in a person’s name or date of birth. 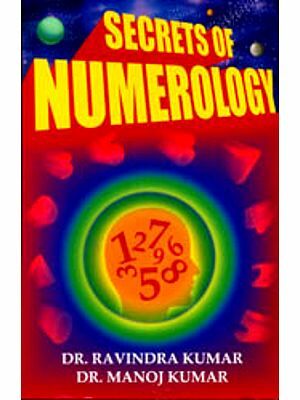 Numerology is the science of numbers which interpretes and predicts the destiny of a person taking into account his date of birth and the numerical value of the letters of the name. There are a number of systems that evolved since the inception of civilization to foretell the present, past and future. Out of these systems, Numerology is also one of the most prominent systems and is being practiced effectively since ancient times in different regions of the world, of course with certain subtle variations. 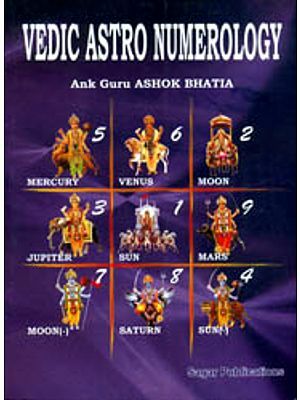 In India also, it evolved during the Vedic Period and since then our Seers and Rishis have used this wonderful science to foretell the destiny of human being very correctly and effectively and guided them to shape up their activities as per the indication of the numbers being prominent at a particular point of time. This book is presented before the readers and the students of AIFAS to enable them to understand the power of numbers, calculate them and use them effectively in their lives. Purely Vedic system has been incorporated within the ambit of the book although there are several other effective systems prevalent in different parts of the world. The whole book has been divided into 12 chapters. 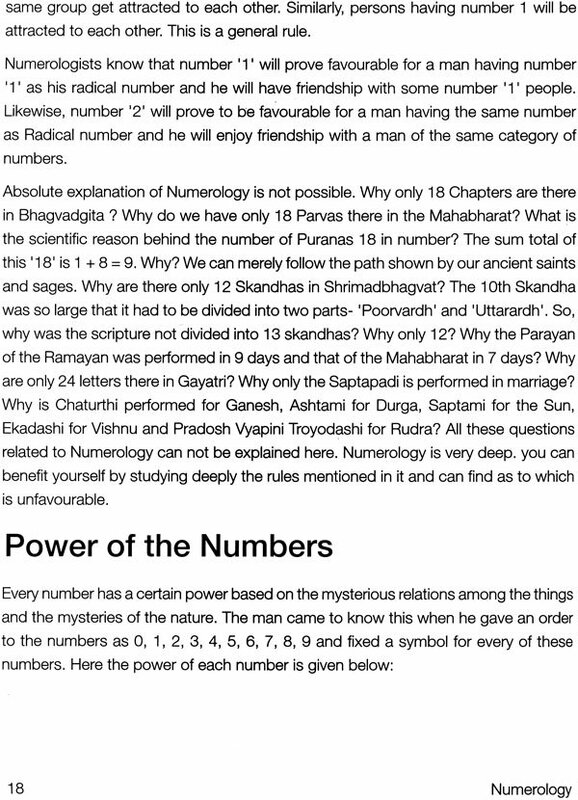 The first two chapters deal with the origin, nature and qualities of numbers. Chapter 3 and 4 teach how to calculate the Radical and Lucky numbers and predict on the basis of these numbers. Chapters 5 and 6 are about the calculation of name numbers, preparation of Ank kundli and their interpretation. 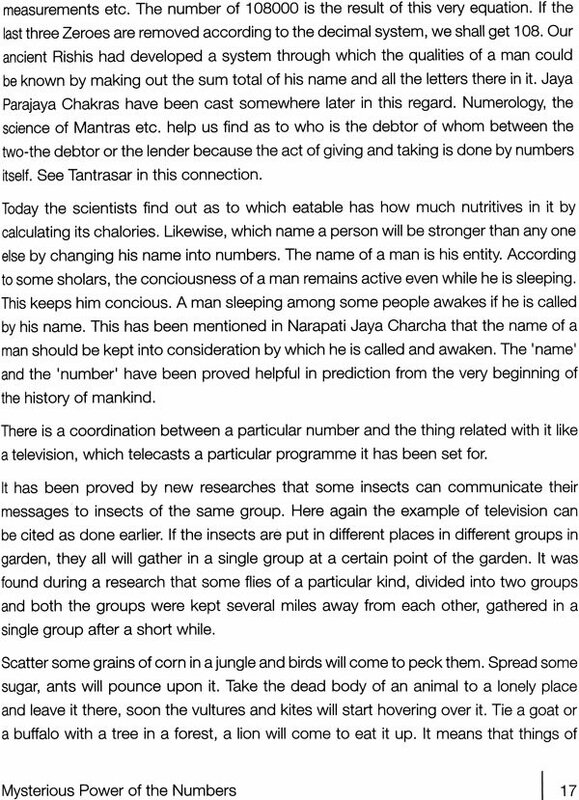 Chapter 7 deals with the Mook Prashna in which it is interpreted how a numerologist can predict about the nature of a question the querist is about to ask and how and where a lost object can be found. The rest of the chapters are concerned with the remedial measures to rectify the ill effects of any particular number or group of numbers. I hope this book will prove very beneficial to the readers and students. A number is closely related to sound and action. The Zero represents the Nirakar Brahma or infinity. In fact, this world has originated from Zero and all the things in the world get themselves merged with it. 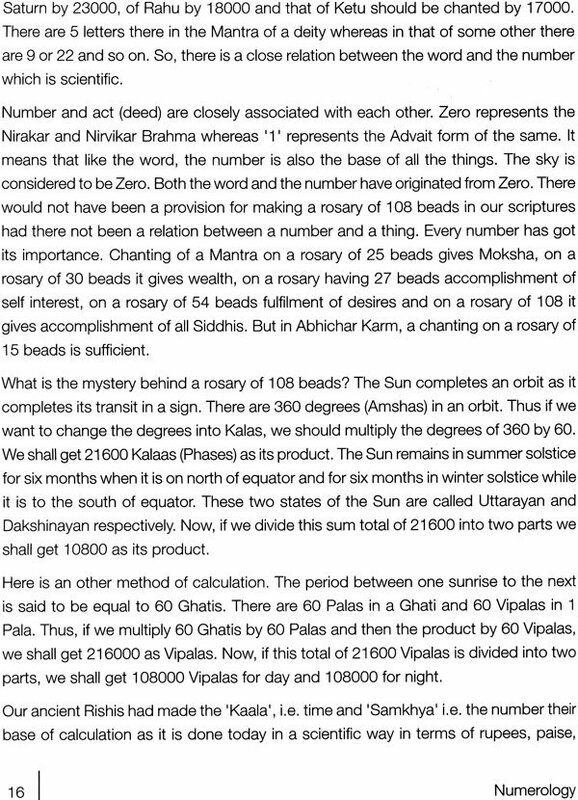 This Zero is subtle as well as infinite (Sookshma and Vrihad). If we look around us we find that the entire world is circular. The sky looks like a Zero; the earth, air, water, fire and such things look like a Zero. Likewise, our physical constitution is also like a Zero. So, the power of Zero is infinite and this Zero was invented by our saints and sages and today it is accepted by the entire world. Today, we are in the age of computer which is also based on Zero itself. It is called a dot in the language of computer. The universe originated from zero which was considered to be one and one only. It means that there is some unknown and unseen power that runs and governs this world the way it likes. We call this power Brahm. 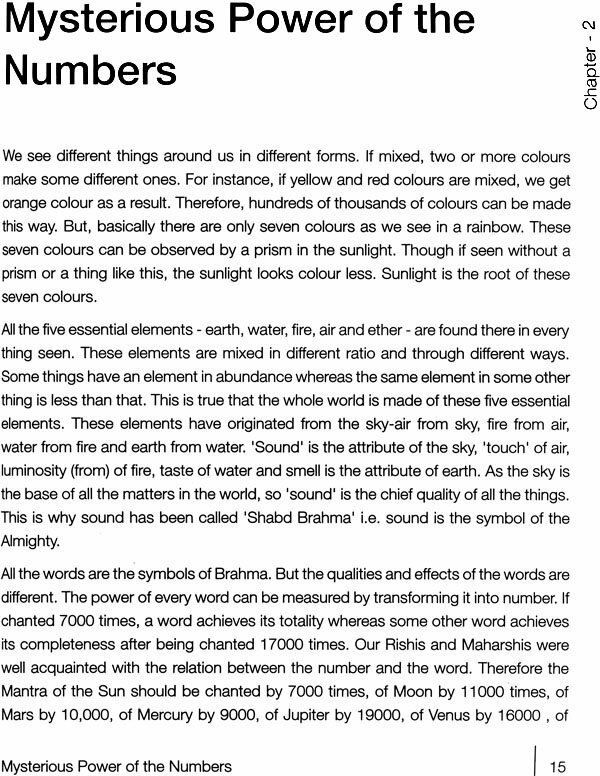 This Brahm is the only power, however, it is called by different names. The man found only two stars in the sky, the Sun and the Moon when he came into existence. So, there are only two seen planets and none else that can guide the mankind. The Sun rises every day, so it has been given the first place and number one represents it. The Sun, the lord of number one, is associated with the soul. This helps man know the Atmashakti (psychic force) of the individual and the community. The night was created by the Moon and hence it has been given the second place and it represents number two. It stands for worldly pleasure. It bestows reasoning faculty to us. The Sun is considered to be a masculine planet. In real life, the man has been given preferential treatment. A woman has two sides – one is of a girl and the other of a woman i.e. wife. Both the sides have their own entities. The Moon is considered to be a feminine planet and a woman has Kalaas like Moon. A woman becomes Shuddha (clean) after twenty – seven days like the Moon that transits over all the constellations in 27 days. The man came to know the power of Brahm when found the sky, the earth and the waters and thus number three came into existence. So, this number three was considered to be the number of vastness and Jupiter was accepted as its lord. Jupiter is associated with the soul. This makes people know the vastness of the world and the soul. We have only three gods who are the lords of Trishakti – desire, knowledge and performance. There are three attributes in these three powers i.e. Trishakti. Lord Brahma is Satoguni having the qualities of goodness and purity. Lord Vishnu is Rajoguni and Lord Shiva is Tamoguni. All the three lords have three powers-creation, protection and destruction respectively. Or, desire the Brahmi Shakti, Performance Vaishnavi and knowledge is that of Gauri. All these three powers represent Moon, Sun and Fire respectively. The three stages of life i.e. childhood youthfulness and old age are also represented by these three powers. In childhood, body of a boy or a girl grows up like the Kalaas of the Moon, in youthfulness, it shines like the Sun and senility leads towards fire i.e. destruction. In the body of a man or a woman, Ida, Pingala and Sushumha are the nerves more important than the others. The man has only three Karmas (deeds) Sanchit (accumulated), Prarabdha (destiny) and Aagaami. When the man opened his eyes wide in the world he found four directions, from which emerged number four. This number of four represents four streams of the Vedas, four sub sections or divisions of theirs and four castes in the society. The number was entrusted to Rahu or Herschel the symbol of change, of aggressiveness. Herschel is associated with worldly pleasure. This gives elan vital (Jeevan Shakti) to the man. The number represents the four states (Jaagrataadivastha). All the four religions, four places of pilgrimage are merged into this number. There are four kinds of the body vegetation i.e. sprouting from beneath the ground (udbhijja) tree, sweat born (swedaja) – worm and insect, born out of an egg (Andaja) – serpent, fish, bird and born from the womb. We have four treasures-Annamay, mental (Manomaya), consisting of knowledge or science (Viggyanmay), consisting of happiness (Anandmay). After this the man came to know the five elements essential for life, of which the body consists – earth, water, fire, air and ether. Then he knew the five attributes-sound, touch, form, taste and smell. Then five deities were descended to represent these five attributes and thus came number five into existence. The god gives us knowledge, wisdom and voice. Mercury became the lord of number five. Mercury stands for mental happiness. It makes the man know the wisdom and conscience. This number of five represents our Panchshaktis, Panchshaktis, Panch Ratnas, Panch Vanas, Panch Kamdeva, Panch Kalaas, Panch Makaaras, Panch Bhootas, Panch Richas, Panch Pranas etc. Then came tastes of which there are six kinds – sweet, salty, bitter, acridity, astringent and sour. There are six kinds of philosophy – education, form, grammar (Vyakaran), Nirukti, Chhand and Astrology (Jyotish) or Vedanta, Sankhya, Meemamsa, Vaisheshik, Nyaay and Logic. There are six Amnaayas – Poorvaamnaay, Dakshinaamnaay, Paschimaamnaay, Uttaraamnaay, Urdhvaamnaay and Adhamaanaay. All the seasons are six in number. 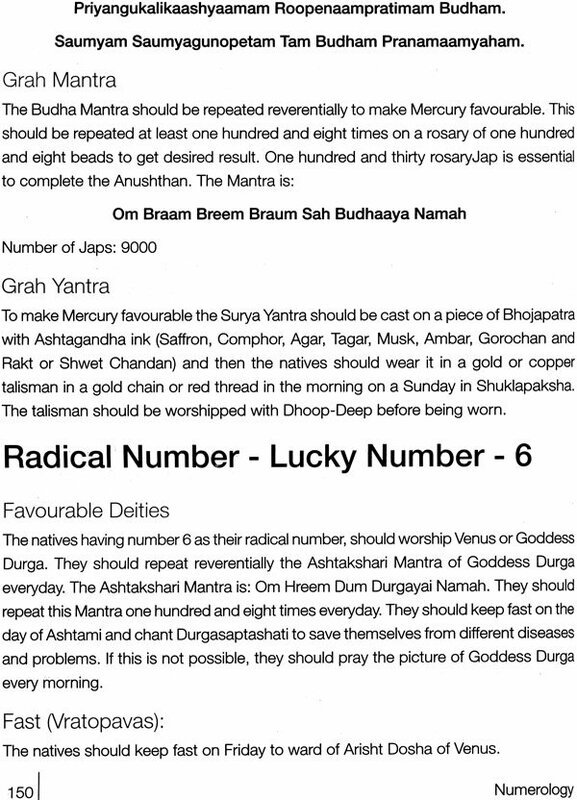 Likewise, there are six kinds of pleasure, six treasures, six Dakinis, six paths, Shatkon Yantra and six bases. The number of six was entrusted to Venus. Shukracharya was versed in Mritasanjeevani, Tantra-Mantra and sixty-four Kalaas, which are all under the influence of Venus. 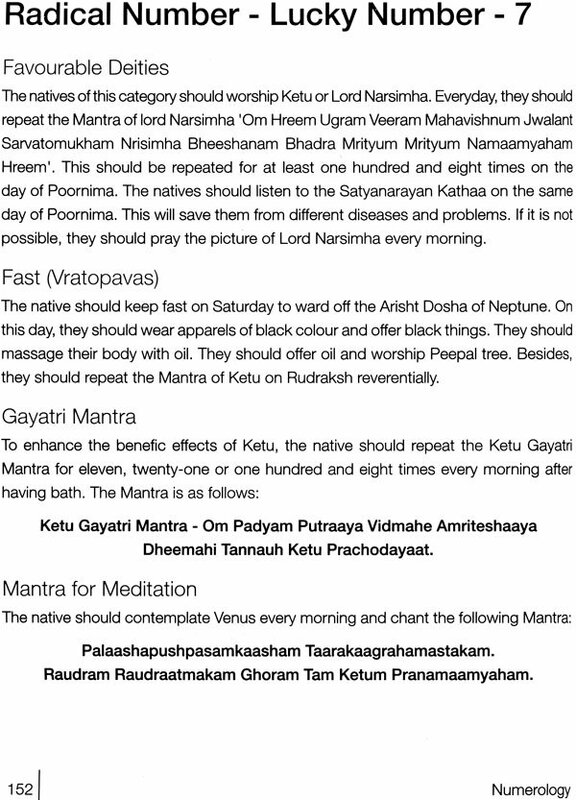 Venus renders mental and sixty-four Kalaas, which are all under the influence of Venus. Venus renders mental pleasures. It affects directly the sentiments and emotions of the mankind. All the glory, virility, reputation, Shree (prosperity), knowledge and form are the six qualities Samashti (totality) of which is called Bhagya. Hunger, thirst, grief, Moh (infatutation), period of old age and death are the six stages of the body. This number of six denotes the veins, bones and MAJJA, blood, skin and flesh of the body of a person. As the man started watching the sky, he got acquainted with the Saptarshi. He found seven rivers and their seven streams. He knew the seven notes of music and thus the number of seven was introduced. All these are the Saptaloka (the seven worlds) of ours. There are seven ways to hell. 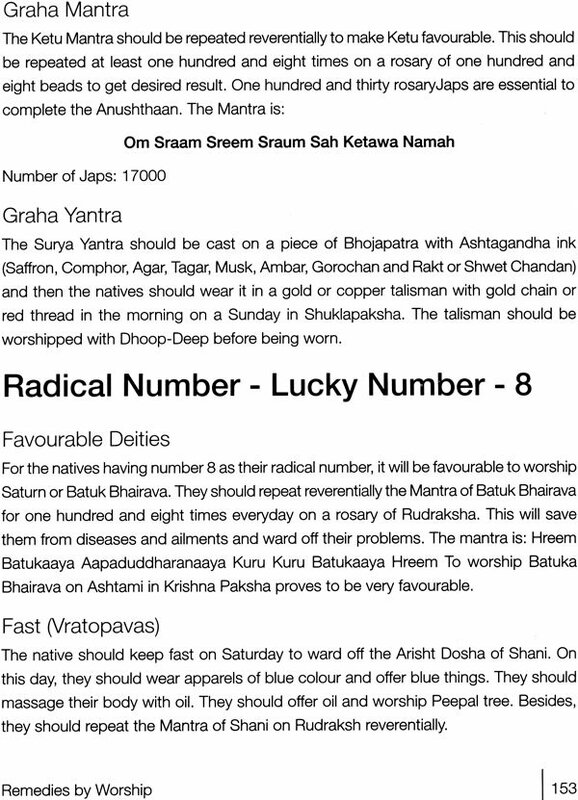 Planet Ketu or Neptune is considered to be the lord of this number of seven. Neptune gives mental happiness. It gives the man imaginative faculty. The number of seven represents Saptaloka, seven mountains, seven seas, seven planets, seven kings, Saptrishis, seven Samidhas (sacrificial firewood), Saptajihvas of fire, seven horses of the chariots of the sun, seven colours and seven metals. The man started worshipping Ashta Bhairavas, Ashta Siddhis and Ashta Peethas to protect all the things stated above. This number is said to be under the influence of Saturn, who either afflicts the man or gets him free from agonies and afflictions. Saturn gives material happiness. It has the powers to weaken the body of the man. There are eight Vasus (serpents), eight mothers, Asht Nadis and Marmas, Asht Gandhas, Asht Paashaas(chains) – Ghrina (abhorrence), Lajja (modesty), Bhaya (fear), Shoka (Grief), Jugupsa (disgust), Kul (lineage), Sheel (moral conduct) and Jaati (caste). All the living beings are surrounded by these Paashas. They, who are free from these, are Sadaashiva.